All are Welcome at Paradise Lutheran Church! Paradise Lutheran Church is centrally located in the heart of Paradise, California. It is located off the Skyway, next to Terry Ashe Park, and CVS Pharmacy. 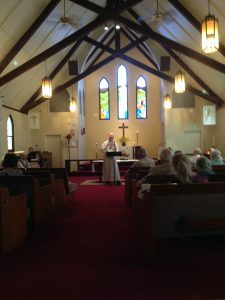 Paradise Lutheran Church offers Worship with Communion every Sunday at 10:00 am and on holy days. The communion table is open to all. It is the Lord’s Table—not the Lutheran table or the table for only the “baptized” or the “confirmed”—it’s the Lord’s Table and All are welcome. Paradise Lutheran Church (PLC) is a community of people from diverse and varied backgrounds and experiences. We come from many walks of life and from many religious traditions – or from no religious traditions. Some of us are looking for new ways to experience meaningful and purposeful existence and relationships within a Christian context. Some, on the other hand, have come out of restrictive religious traditions and experiences and are seeking the freedom to find an identity that can flourish within the spiritual and intellectual freedom offered by this community. Still others have come out of hurtful relationships and are seeking a safe, secure, and affirming community that will help them to begin to trust again. And still others are looking for an environment that will enable them to ask questions and explore the roots, development, and ramifications of the Christian experience within our complex society today. Regardless of your reasons for checking us out, you will find an intellectual, spiritual, and emotional home at Paradise Lutheran, where questions are encouraged, and where often times there are more questions than answers. We welcome everyone including nontraditional families such as cohabitating couples, older singles and the divorced, unmarried mothers, gay or lesbian people and their partners, single parents, and of course, children! We offer a full range of programming for all ages and interests with an emphasis on providing meaningful service to our community and to making a difference in the lives of our neighbors. Come and give us a try. Regardless of where you are on your journey, you will find a supportive and exciting community experience. All are welcome!